This pictures was taken on their short holiday at Madeira, early on March. See the resemblance here with dad Cristiano Ronaldo ?? Anyway, on the pictures below, Junior is wearing all Gucci clothes, including shoes. Cris wants to make sure that his son gets the best product. 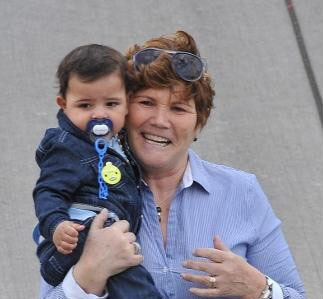 Sooooo……..adorable…… It looks like Dolly didn’t seems to mind his grandson pictures got taken by papz. A good sign, maybe soon Junior will go publicly more often.